Home / Blog / Collection / CleanRiver’s General Manager Hugh Caines: Why I LOVE the BevvyBin! 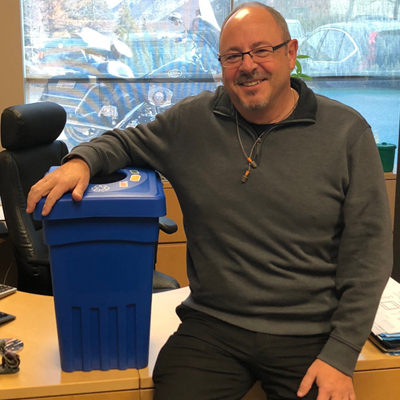 CleanRiver’s General Manager Hugh Caines: Why I LOVE the BevvyBin! 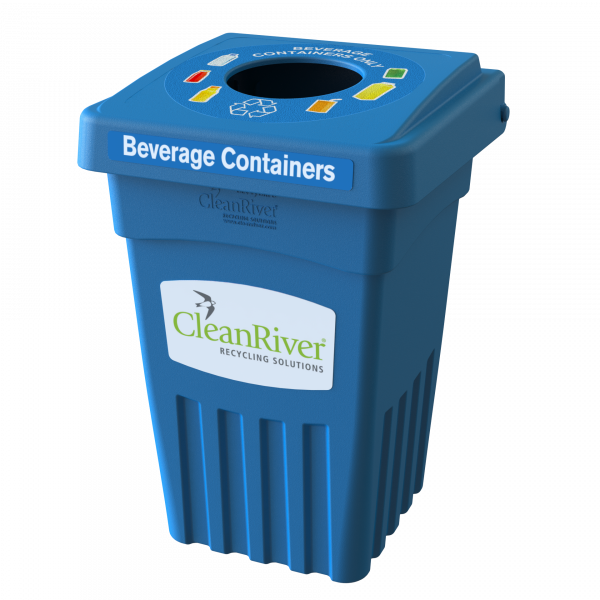 CleanRiver is excited to announce the official launch date of our latest recycling innovation: the BevvyBin8. But no one is quite as excited about its debut on the sustainable market as the man behind the bin, CleanRiver General Manager Hugh Caines. 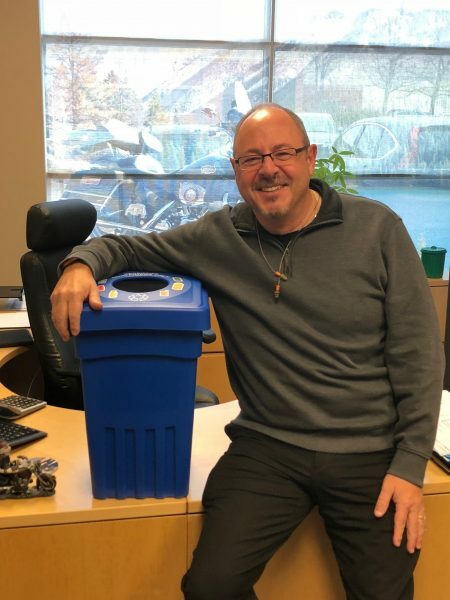 After a year of design, development and testing the concept, Hugh has driven the BevvyBin project with the intent that it will be a game changer for single stream waste collection. On the eve of its launch, Hugh reflects on what makes the BevvyBin8 so unique and why it will remain near and dear to his heart. Where did the concept of the BevvyBin come from? It was on a trip to Winnipeg last fall to meet with a customer who we had a five-year relationship with. When they mentioned they were looking for a recycling solution for single family dwellings. They needed a recycling bin that could fit neatly under a sink or stand alone in the kitchen. They had specific dimension requirements and opening shape requests, as they wanted consistency throughout all the units in their building. Thus, for the first time we began to seriously explore developing a small single stream waste container and I began to see its potential as a multi-purpose bin and not just for residential application. What makes the BevvyBin different to other comparable bins in the market? The BevvyBin is made out of flexible recyclable high-density polyethylene (HDPE), which makes it extremely durable and sturdy compared to other waste bins of a similar size and price currently in the market. The hinged lid is easy to service and is available with different opening shapes and sizes. You can even customize the shape of the opening to meet your waste stream needs and keep the restrictive opening specific to what that bin is collecting. It comes in two sizes 20gal and 8gal capacities. We’ve incorporated our unique (CleanRiver) bag tie system to help prevent waste spills especially when heavy organic waste is collected. BevvyBins can also be stored inside one another for easy shipping and for easy storage when you are moving bins in and out of facilities for special events. The lid and base graphics can be customized to meet your recycling programs needs. What industries or markets do you think would benefit from the BevvyBin? College Campuses for sure! It was around this same time I was moving my daughter into residence for her first year of University when I noticed that each dorm floor had 4 blue bins lined up next to each other, each with an 8.5” X 11” piece of paper taped above indicating what waste stream each collected. I couldn’t believe it! CleanRiver has worked with over 1,000 Universities & Colleges across North America, so I know how important branding and aesthetics are to post-secondary education. You could tell that this was an afterthought. College Campuses invest a lot in branding and getting the right bins everywhere else on campus, I realized that many still didn’t have the right bins for campus dorms. 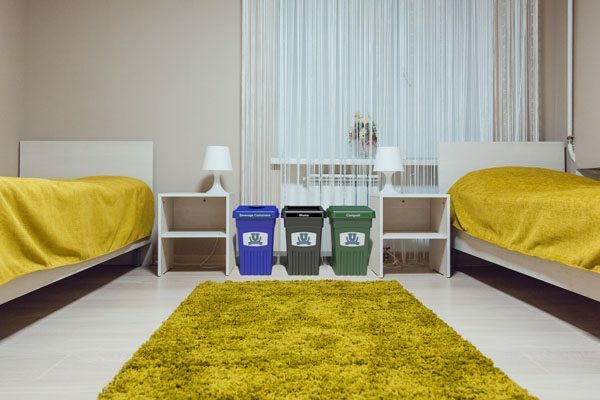 The BevvyBin is the ideal solution for dorm rooms and floors. Sturdy, colour coded and clear graphics for each stream. The BevvyBin can be easily branded with base labels. 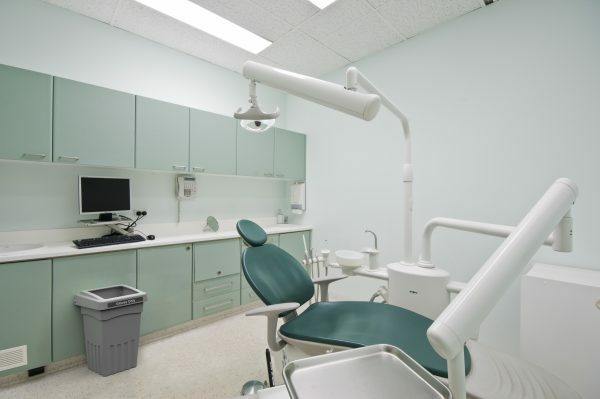 Hospitals and dental offices are another great fit. Great for patient rooms and behind nursing stations. The restrictive openings can be customized to collect stream specific items that are filling up your waste and can be either recycled or reused like cloth or latex gloves. The BevvyBin is the perfect support to any health care facility recycling program. Elementary and Secondary classrooms, most do not have any type of standardized bins in each room. A set of three BevvyBins for waste, recycling and compost would be ideal and inexpensive. Students could help choose the items they think would best guide them to help them separate their waste and customize the graphics for each BevvyBIn. Plus the BevvyBin is easy to service and clean quickly for the custodial staff. Why do YOU love the BevvyBin? I know I am biased but it’s just a GREAT LOOKING bin! It’s just aesthetically pleasing, and I continue to get impressed reactions to the size and design of the bin when I show it to customers. It’s not some bulky bag or bin in the corner, its design allows it to fit easily under a counter or nestled tight against the wall. I love it because I see it as a multipurpose bin. It’s strength, durability and size make it open to many different applications and I see it being used to hold and collect so much more than just waste. What do you want everyone to know about the Bevvy Bin? The bottom line is that the BevvyBin provides a lot of bang for your buck! There is no other bin quite like it in function, design and durability on the market. I think it’s a great size and value to either help you simply get started when trying to implement a recycling program, or as an addition and support to your current recycling program. 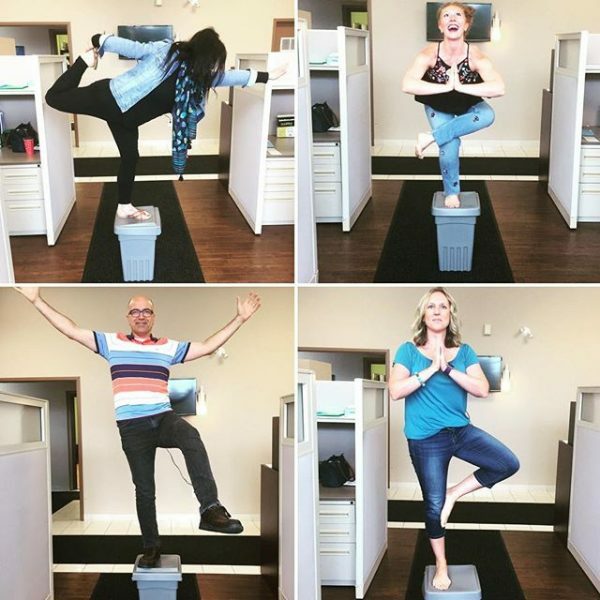 Similar to our mini bin program, the BevvyBIn would be a great addition to any office recycling program to decrease contamination rates and get people effectively separating their waste. A bin that diverts waste from landfill, made from strong recyclable material, is inexpensive, aesthetically pleasing AND saves you money? What’s not to Love? For more information on how to start a recycling program, check out our past blogs 5 Steps to a Successful Recycling Program and 4 Most Commonly Asked Questions About Campus Recycling.